Last Thursday was Charles Darwin's 200th birthday. He lived to experience 83 of those years, while we have all been experiencing a world fundamentally changed by his innovative work ever since. Where did he get the idea for his theory of evolution? When did the light bulb go off above his head? 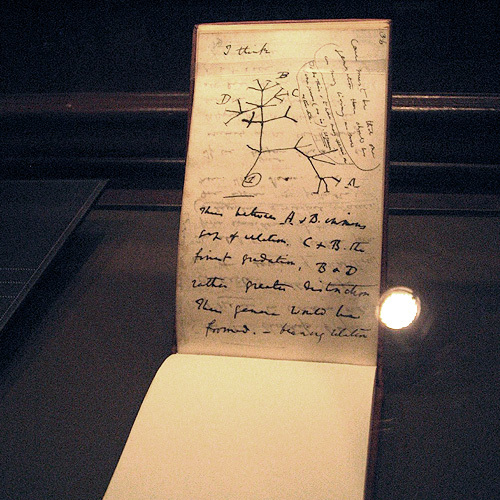 A photo I took of Page 36 from one of Charles Darwin's sketchbooks. It has been on display at the American Museum of Natural History in New York where an exhibit placard describes it as the first expression of the evolutionary family tree. The top of the page starts with, "I think." 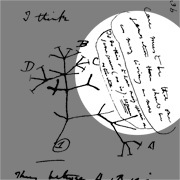 To answer the question of where Darwin got this radical, world-changing idea, we should pause and look closely at this sketch. If it represents the moment when evolution sprang from Darwin's head into the real world, what can it tell us about how new ideas are created? First it tells us that it's just a sketch. That page took maybe five minutes for him to scribble out--if that. That's not quite a "flash of inspiration" from on high. That's a quick, loose, and very disposable idea on paper. Darwin clearly treated it that way because within moments he was on to the next page, not doing cartwheels over his "discovery." I love that the museum paused their exhibit here. It made my jaw drop when I saw it, but you have to be careful when you fall too much in love with any one design idea like this. You can easily miss that the story it is telling is less about the sketch itself than about the process of sketching. Similar pages preceded and followed this one. Entire sketchbooks came before and after. This process should look familiar to any designer. This is the hard work of design thinking in action on one of the most important ideas to come about in the past two centuries, not a light bulb moment. Darwin spent five years of hands-on geologic field research aboard the HMS Beagle. His focused experiences with rocks, fossils, earthquakes and more were fundamental to the leaps in thinking about the nature of life that he made later on in his career. Darwin didn't just read books and debate colleagues in the Royal Society, he got out in the field to learn from "real experts" with practical experience such as colonists and farmers breeding livestock. This was unusual for a scientist of his time, but useful to him. It cut down his learning curve so he could provide a more well-rounded argument faster than he otherwise would. As the above example shows, sketches are mini conversations a designer has with their idea on paper. They are the best, fastest way to let one thing lead to another. Their looseness provides a springboard for new interpretations of ideas. Sketches are recyclable. Look closely at that this page again. See those notes scribbled sideways in the upper right with circles around them? Those came later. That's Darwin returning to this page after exploring and reworking his ideas to add something new to this one. That's the iterative process of design at work. Hardly his own idea alone, Darwin benefitted from the experience, expertise, and efforts of colleagues such as the captain of the HMS Beagle, an evangelist back home, a whip-smart botanist who would chop up his work, and the anonymous author who published a more controversial mainstream account of evolution first. This list of similarities goes on. Darwin had friendly **competition** in the form of one Alfred Russell Wallace who actually beat him to market with his own account of natural selection, an event that fired up Charles to publish his own more successful work. You could even say Darwin used the ultimate form of timeboxing: he was afraid he was going to die from health issues in his early 30s which motivated him to get scrappy sketching and outlining an essay he hoped others would finish if he could not. All told, *I think* these things make Charles Darwin a designer. Where'd I get this crazy idea? I had fun on a rainy day retracing my own steps to draw a simple mind map showing the events and ideas that I think made this article come together. For all the dots that fit in this page, there are dozens of other experiences I have had that do not.